If you’ve never had a toothache, you would be amazed how something so small can hurt so much. If you experience a toothache, it is an indication of a problem, and you should make an appointment with your dentist right away. Even a simple problem may become more severe if ignored for too long, leading to more intense pain or more costly dental repairs. Our patients are welcomed and treated with respect and compassion for any dental care needs. If you are in pain, rest assured that we will make your visit as comfortable as possible, and we want to dispel any fears when seeking dental treatment. When you come to us, we will use our extensive knowledge and experience to ascertain the source of your pain and determine how best to treat it. Sometimes a toothache is a simple issue that is resolved quickly and easily with a tooth filling. Not all dental practices are the same though, and we want to help you in understanding that the use of metal-free fillings is a conscious and important choice we’ve made for the benefit of our patients. 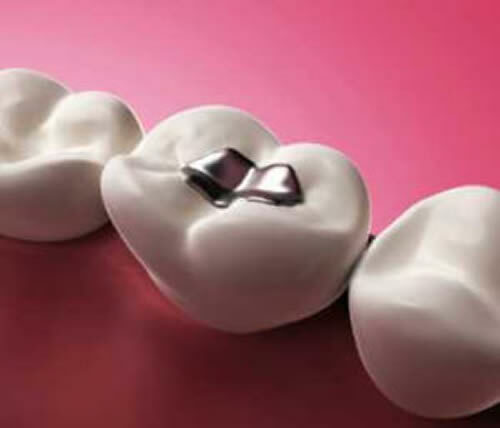 We use only composite, metal-free fillings for a number of reasons. Research results have indicated that composite material is safer for the body. It also adheres better to a prepared tooth surface to provide a more durable filling. Composite material offers more appealing aesthetics also, since the color blends with the color of your tooth. The result is a more pleasing and natural-looking smile. A tooth to be filled will be drilled and cleaned of any decay, and the filling is then placed to seal out further harmful bacteria from entering the tooth structure. If a tooth that has previously been filled is a source of pain, the dentist will examine it to ensure that the filling is intact. Another problem could be pain that radiates from a patient’s bite alignment. In this scenario, an area of a tooth needs to be adjusted where it contacts the surface of another tooth. A filling or cavity could also exist close to the pulp of a tooth, and this may cause the tooth to be more sensitive and painful. If you live or work in or around the North Hollywood area, Dr. Fadi Edmond Elzayat and the A-Dental Center staff invite you to trust their expertise to resolve your dental concerns. Call and schedule an appointment for your next routine dental visit, or contact us to diagnose and treat any dental pain or issue. We look forward to being your trusted dental care practice in every situation.